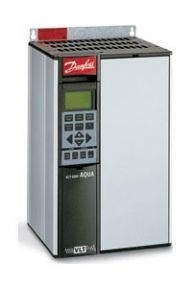 The Danfoss VLT 8000 AQUA is a dedicated drive for Water and Waste water applications. It has all the good traditional features a Danfoss drive, while offering a little bit extra. This drive is built for both constant torque and variable torque in applications including water, sludge and dosing pumps, aeration blowers, pumps, irrigation equipment, water desalination machines, etc. For these applications, specific software features have been developed to ensure optimum control and energy savings.